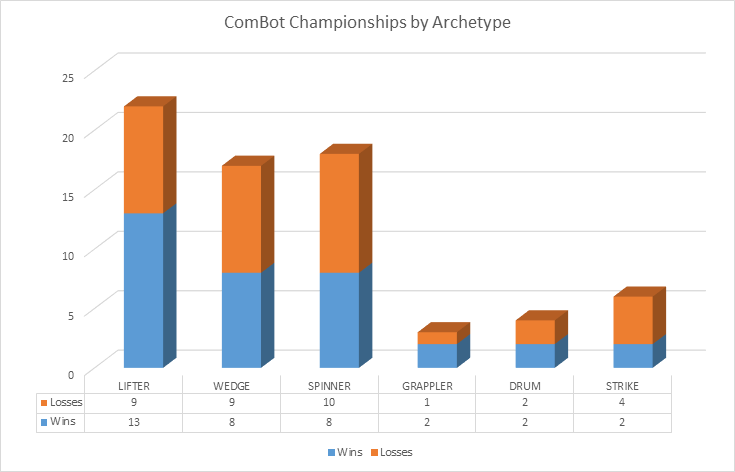 Welcome to Part Two of denkbots’ meta-analysis on combat robots: Analysis of Championship Fights! We will use much of the terminology established in Part One: Introduction to Robot Archetypes so take a moment to review if needed. In the United States, competitive robot fighting has had four major running events that have crowned champions. The first was the original Robot Wars which took place form 1994 to 1997. The second was/is its progeny BattleBots which originally aired form 1999 to 2002 and returned to TV in 2015. The third is the Robolympics (aka RoboGames) which ran from 2004 to 2013 and returned in 2015. The fourth is the ComBots Cup, which originally took place in 2005 and then ran from 2007 to 2012. KEY: W = Wedge; L = Lifter; G = Grappler; S = Spinner; D = Drum; K = striKe. **NOTE: RobotWars 1994 is not included in the analysis below due to unique robot designs that do not fit into the classification system used in said analysis. *NOTE: In this analysis, and all following analysis, Sewer Snake is categorized as a LIFT type robot. This is based not only on its weapon configurations, but on his fighting style. 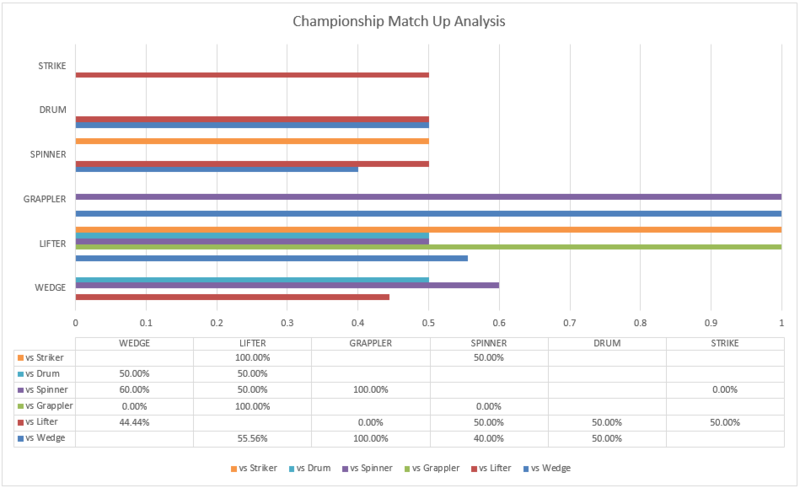 By comparing the match ups in each championships fight, we can build a match up analysis to determine the win rate of each archetype versus other archetypes. Below is a table summarizing this analysis. While this simple analysis might not seem to provide overwhelming insight at first, the tools we have employed scale with sample size. This means that when we expand from 30 robots in 36 matches to 400+ robots in 1300+ matches, we can begin to piece together a clearer picture of the interactions between robot archetypes.